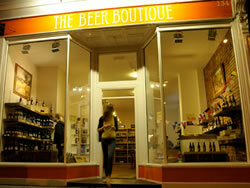 The Beer Boutique looks just like a bit of old Bruges in SW London and specialises, in its own words, in supplying the finest beers in the world with both enthusiastic professionalism and extensive knowledge of the wide range of bottled and draft beers stocked. Jonathan & his team who run the place give hope for the future of proper beer as they are, or at least they look like, twenty somethings and enjoy offering their own favourite beers as well as the opportunity to try some of the delectable, exotic and the unfamiliar samples. Ale can be young or old as these guys prove. It can even, whisper it, be a bit fashionable. From the art deco logo, to the eccentric window dressing and old wooden shelving you get a feeling that the place is loved and cherished as is the stock which ranges far beyond your supermarket favourites, and includes Rick Stein and Sharp’s Chalky, through the USA (more breweries than any other nation), to Germany and Bamberg in particular (try the unique Schlenkerla smoked beer), to Belgium and its famous Trappist beers, stopping off to risk a yeasty Gueuze. Beer books, takeaway ale, including the very local Wandle on draft, tutored tasting sessions and great music in the background make it the perfect place to pick up a last minute Christmas Pick Your Own 4-pack. Leave behind at the door all thoughts of tinned lager and don your connoisseur drinking boots. As the great Beer Hunter, the other Michael Jackson, used to say “the search for the perfect pint is never over”; but in Putney at least, it’s now a step closer.